The Minidun interior. The atrei living in this region speak Minidun. The Whites living in this region are typically descended from French settlers. Rarsecin -- here is Ceiolai, Berg's largest city and traditional capital, plus its supporting countryside. Foi-Pentana -- totally mountainous, with hot springs, geysers & lakes. 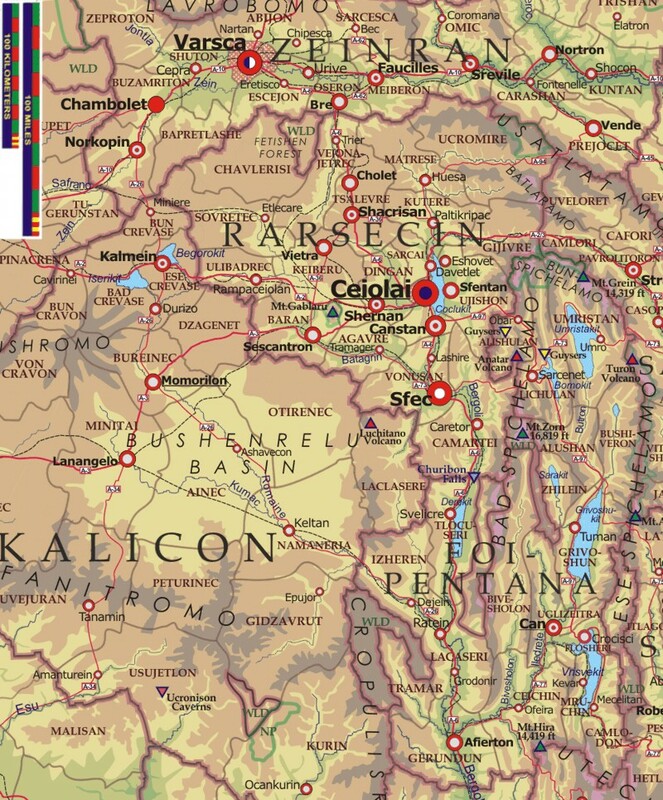 Kalicon -- rural, includes very green lake country of Crevase, also the dry Bushenrelu basin. In colonial times this area was organized by the French as the colony called "Le Plateau," which in turn became one of the first seven states after 1880. This region consists of the volcanic Spichelamo Mountains and the eastern end of the Ifuno Plateau, with many valleys and lakes. Rarsecin is the second largest lesre in the country, with 15.6 million people. 11.2 of these people live in the Ceiolai Tunet (Federated City), which includes all the cities ringing lake Coclu. Another 1.2 million live just south of there along the Bergoli River in Sfec. The remainder live in the rolling sandstone hills and broad green valleys of the countryside. Ceiolai is one of the great cities of the world. It is the most revered icon of Bergonian civilization, the seat of past Empires, and the cultural center of the modern nation. It is located on the western shore of the narrow finger lake called Coclu, the "Black Lake." Coclu drains southward into the Bergoli River. Ceiolai's personality is quite the opposite of Lefitoni's, the other great city of Bergonia. While Lefitoni is carefully planned, and its avenues are wide and straight, Ceiolai's narrow streets twist and meander willy-nilly. There is no grid or pattern to the city whatsoever. Few superhighways exist in Ceiolai and none penetrate into the city's core. Motor traffic is difficult in the city. The city government has done little to improve the traffic, trusting that the sheer difficulty of navigating the streets and the virtual impossibility of finding parking will encourage people to use the new subway system that was completed in 1982. Construction on the subway began in 1950. It is state of the art. The stations are of a par with those of the famous Moscow subway. The stations include large underground galleries adorned with beautifully carved wooden paneling. Many of the galleries are lined with shops to enable the commuters to perform their errands as they travel through the system. The center of Ceiolai has many old buildings, some of which are more than 1500 years old. Among the best preserved is the Old White Fort, a grand structure built in the early days of the Second Empire. This was built to house the main contingent of the Imperial Army in those days. The Old White Fort takes its name from the pale limestone ought of which the outer walls are built. Ceiolai's center is a flat area adjacent to the lakeside called the Old Town. This section is the old heart of the city and is where the original settlement was located 2,500 years ago. Old Town surrounds a large lakeside plaza called Zereitlemar. This plaza was the center of the ancient Imperial City. At its south end is the venerable Tufralan, the palace of the Emperors. To the south of it are the ruins of the Imperial Government Forum, the location of all the Imperial ministries, once a beehive of scribes and bureaucrats. The massive walled Tufralan, the Imperial Complex was constructed by the rulers of the Second Ceiolaian Empire in approximately 600 A.D. A seventy-foot high wall surrounded a half square mile of palaces, government buildings, temples, villas, courtyards and gardens. Throughout the centuries, successive Ceiolaian regimes have continued to use it as their seat of government, notwithstanding several brutalizing invasions and numerous fires. Many of the buildings within the Tufralan have been rebuilt throughout the centuries. Nowadays one can observe within the Tufralan a thousand years worth of different architectural styles. None of the buildings are now used, save for museums, but the Tufralan is the nation's biggest tourist attraction. No one has resided within or otherwise used the Tufralan since before Columbus. On the western end of the Zereitlemar is the Temple of Anramrapal, built before the Tufralan in the time of the First Empire, probably completed around 310 B.C. The temple was well tended by the devoutly Shufrantei rulers of the Second Empire, even though the temple was built by priests of Nine-God Worship, which Shufrantei worship opposed and replaced. Like the Church of St. Sophia in Istanbul, which the Moslems converted into a mosque, this temple was converted to the needs of a new religion in the wake of a dramatic historical change. The Temple fell into disrepair in the subsequent days of the "Shrinking." However throughout history various Shufrantei priests have gone to great trouble to keep the roof in good shape. As a result the brilliantly colored frescoes and the inlaid marble floors are in excellent shape, given the age of the place. By comparison, hardly any of the buildings of the Roman Republic or Classical Greece are still with us. On the north end of the Zereitlemar stands the huge Vestarai Temple, built by the Emperors of the Second Emperors i the 400s to house the Dojonet, their chief Shufrantei priest, and his retinue. The Vestarai contained a large religious library and enclosed four courtyards, each with a reflecting pool. There was a large sanctuary for public worship as well as several smaller sanctuaries for the private worship of the priests. From the outside, the complex appears to be one large square building, with one magnificent staircase leading up to a wide entrance into the public sanctuary decorated with pillars. The remainder of the exterior is flat walls, all away around, save for several small doorways in the rear, but these walls are intricately decorated with marble reliefs portraying scenes out of Shufrantei myth. Old Town itself is a stew of architectural styles, ranging over various periods in the last one thousand years. Much of this area consists of narrow streets lined with townhouses and apartment buildings. Along the major streets, however, are many shops and department stores. Extending northwest of Zereitlemar is the Heavenly Promenade, a wide street that leads up a gentle grade for a mile until it reaches the crest of Capital Hill. The Heavenly Promenade is lined on either side for its entire length with large flower gardens, planted so that colorful blossoms appear year round. At the top of the hill the street terminates with the Capital Plaza, and there sits the Congress House, built in 1816 to house the Bergonian Congress in the time of the First Commonwealth. Many of the significant events of modern Bergonian history have been played out in this building, and out on the plaza, where blood had been spilt for revolutionary ideals. Capitol Hill is also the location of many government buildings constructed in the 1800s. Also there are headquarters for banks, corporations and unions. Running west from Zereitlemar is a street called the Voshrecul. It is the home of the nation's theater district. Many of the finest hotels are in this area. Voshrecul leads to Observatory Hill, which is a fine residential area, where many modern apartment buildings and town houses stand along curving streets located. On the crest of the Observatory Hill, where one is afforded a fine view of the entire Old Town area and the lake beyond, is the Cremation Park. This park is where in times of old the citizens and the priests of ancient Ceiolai performed their ritual cremations on large slabs of marble mounted on the bluffs. The people below regularly saw the smoke rising up to the heavens, conveying the souls of the deceased to their promised repose. On the back side of the Observatory Hill is Mercury Park, a huge amusement park built after the 1932 Revolution. It contains carnival rides, restaurants, cinemas and theaters, and a casino. Also running west from the Zereitlamar is Bergonre Road, named after the great hero of the Second Empire. It leads to a place called Dogwood Plaza, located between two hills, Observatory Hill to the north and Refugee Hill to the south. Dogwood Plaza is a large traffic confluence, with streets coming in from all directions. Dogwood Plaza is lined with stretched of dogwood trees that are brilliant in April. Next to this place is the Utijive Fountains. Running southeast from Zereitlemar is Tribute Road, so named because several times a year the Emperors of old held processions from the suburbs to the Tufralan in which porters pulled wagons laden with the tribute that the occupied areas gave. The Tribute Road leads Zati's Plaza, located on the crest of Refugee Hill. This is a confluence of six major streets. The center of this plaza is the location of the huge dark marble monument called Zati's Arch, built by the medieval tieris of Rasecin. Refugee Hill is the location of the headquarters of many of the present institutions, including the National Labor Federation, the National Commodities Exchange, TeleBergonia, the national television network, the Traders and Citizens Bank, the nation's largest bank. To accommodate the official visitors, there is the massive Mimshunu Hotel Complex, which includes eight large hotels. Refugee Hill is the commercial center of the modern city. Its architecture is modern and sleek. Modern styles from all around the world have been adopted, although the prevailing style is the uniquely Bergonian, which stresses the use of balconies in high buildings, extravagant color, tile work and mosaics, and much more external ornamentation than in European and American buildings. South from Zereitlemar runs Bluebell Street. It extends straight up a hill to the crest of Pine Bluff Hill, where is located the National Museum of History. Unlike the other hills, which are rounded or flat, Pine Bluff has a sharp, relatively steep ridgeline that has discouraged much building. Most of this ridge top has been set aside for the long Pine Bluff Park, by far the largest in the city. In this park are located a world class zoological and botanical garden where much research in species preservation and propagation is done. To the southwest of the city, beyond the Refugee Hill area is Catsicoru University, one of the largest campuses in the nation. Its campus is eight square miles. It is home to the Library of the Nation where all published works are stored, much like the Library of Congress in the United States. It is also home to the National Academies of Law, History, and Economics. West of Ceiolai 35 miles is Mount Gablaru, rising 500 feet in a noble shape from a level plain. This mountain has always been very pleasing to Bergonians through the ages, both esthetically and symbolically. Gablaru is not as high or as gracefully symmetrical as Fuji or Kiliminjaro, but it is close to and visible from Ceiolai, and has become steeped in religious significance. In ancient Pre-Shufrantei religion Gablaru was regarded as the conduit between earth and heaven, the home of the Nine Gods. In Shufrantei tradition Gablaru was regarded as Arkan's footstool and the prayers offered to Arkan from the mountain's base were regarded as especially efficacious. Gablaru is set aside by a national park approximately 70 square miles. The edges of this park are given over to resorts and Miradi monasteries, but the mountain itself, at the center of the park, is virtually sacrosanct. The Emperors ruled that human foot could not tread on the mountain, and in recent decades this rule has been reinstituted. Thus the mountain itself serves as a grand nature preserve, and the people enjoy it by viewing from a distance. This is one of the most rural lesre. The largest city in Kalicon is Kamalein, with just 251,000 population. Most of the people in Kalicon speak the Dura dialect of Minidun, which is spoken in Ceiolai as well. With its proximity, Ceiolai has greatly influenced the history and development of this region. In Pre-Columbian times Ceiolai usually dominated the territory that now comprises Kalicon. In the times of the Second Ceiolaian Empire, an imperial policy promoted settlement of these lands. Other periods of settlement by Ceiolaians occurred later in history. Most of the settlers crossed the inhospitable Bunreshelu for the Sfantitrom Range and to points beyond. Once these mountains were thickly settled, but the plagues of the 1600s decimated this area's population, and the Sfantitrom was never resettled to the same density. Hence the beautiful forests of juniper and oak have grown back. Before 1900 this region was also called Simplonet. Through most of ancient and medieval Bergonia's turbulent history, the region of Crevase was incorporated within Rarsecin, and Rarsecin was always quick to defend it against all comers. This was partly because the "Easy Golden Road," which connected Ceiolai to both Crisitoni and the cities of western Bergonia, passed through Crevase. This highway was the major east-west artery for the trade caravans all throughout the medieval period. But the main attraction of Crevase was not so much the strategic position this highway yielded, but the land's shear beauty, broad wide hills and rolling plateau land with oak and pine forests and open grassland, all centered around two large, very shallow, marshy lakes. Kamlein, a town of distinctive stone buildings, sits on the shores of one of these lovely lakes. Except for the sharply-sloped Kemetrin Ridge extending from the Arutushromo heights, the hills of Crevase are not spectacular nor the vistas inspiring, but the land is intensely green and rich. It is a country of small charming places, attracting the elites from crowded Ceiolai who came and built summer retreats. This area was famous for its goat cheeses, pine nuts, and acorn bread. The center of Kalicon's territory consists of the basin that is named Bunreshelu. This basin is a flat bowl, at an average altitude of 1,850 feet, ringed by ranges of mountains on all four sides. The two charming lakes of Crevase are both drained by the Romaine River, which flows south through the hills of a bunec named Dzagenet down onto and southeasterly across the Bunreshelu basin, and then through a pass, beyond which it joins the Bergoli River. Because the basin is so sheltered by the surrounding ranges little rain reaches its floor. In fact barely ten inches of rain falls in Bunreshelu, so the vegetation is spare, in stark contrast to the verdant growth in some of the surrounding ranges. The vegetation is mainly of a shrubform variety, and historically had little use except for grazing. Thus, Bunreshelu remained throughout all Bergonian history fairly underpopulated. However, in the 1900s the land has been thoroughly irrigated for cotton and citrus orchards. The irrigation projects here are by far the largest in the country, and no where else has so much unproductive land been made fertile. The Sfanitromo Range traverses the southern part of Kalicon from west to east, with peaks from 4,000 to 5,000 feet. Although this range gets variable amounts of rainfall, it is nevertheless naturally wooded with oak and pine, albeit somewhat thinly on their north face. These mountains separate the Bunreshelu basin from the plains of southern Bergonia, and they draw gentle winds from both sides. The natives called these the "breezy hills." The mountaineers survive by cattle and sheep farming, as well as timbering. These mountains are divided into two regions called Usujetlon and Guvejuran. In ancient times the Faroi people lived among these hills, but in time the Ceiolaians spread out over much of Bergonia in their second empire and discovered the pleasures of these cool and fertile mountains. Ceiolaians therefore came and settled, bringing with them their language and ways. After several centuries the Ceiolaians displaced the Faroi, who retreated into the plains to the south in what is now Sanraniclai. The mountains extend eastward into a third region called Kurin, which the Ceiolaians never settled. The people there speak a version of the Sampana dialect, almost identical to that spoken by the Balupi people. The Ucronison Caverns in extreme southern Kalicon, under the southern foothills of the Sfanitromo, are Begonia's largest cave complex. A great section of it is open to the public, including the dramatic 80 feet high waterfall in one huge gallery . There are also deep sections still unexplored. This lesre, like its name, is divided into two parts. The "Pentana" part of the lesre, also called the "lower" or "river" part, embraces the mid part of the Bergoli River valley, below Rarsecin and above the southern coastal plains. This part includes wide green river valleys between high foothills and steep granite blocks. The valleys lie on the lee side of the ranges that determine climate in eastern Bergonia, so they receive little rain, but some of the ridges, particularly the eastern faces, see heavy rains at times, and there is much gray sky, fog, mist and drizzle in the high places. In the wide valleys are dairy and sheep farms and granite quarries. The valleys are also home to vineyards and orchards. The center of this area is the home to Lake Maran, meaning "Mara's Lake." In the ancient Minidun mythology Mara was the Goddess of Death and the Intercessor, who weeps for the suffering of this life and gives them succor and comfort in their slumber of death. Her skirts are long and dark, but not starred, like Icotesi. The Bergoli flows from Rarsecin to the north into the northern end of Maran, and then continues on its way from the south end on down toward the sea. The lake is unusually deep for a river lake and gives up to those who live in the villages on the shore plenty of fish. The "Foi" part of the lesre consists of the craggy ranges of the Spichelamo Mountains, and also the elevated basin they enclose. This basin, homeland to the Foi people, is really nothing more than a network of narrow rivers rushing down long straight valleys between straight-sided mountains, plus several finger lakes, which all feed into the Iledreti River that in turn empties into the Bergoli. The ranges are capped with snowy peaks with shoulders covered with glaciers. The ranges tower above the tree line. Pastures interspersed between pine forests and cliffs provide sparse feed for mountain dairy cattle. These ranges are home to bear, preba cat, and eagle. These ridges block air currents from the east and force them to give up their moisture by formation of clouds, mist and rain. Here and there are dense temperate rain and cloud forests. The Spichelamos are a system of new mountains, geologically young, uplifting with volcanic and seismic force. Thus Foi has four volcanoes that have been active in historical time, although none of them have erupted in modern times.. Foi is also a land of geysers and hot springs, with more geysers than any place else on earth, including Yellowstone. There are hot springs at the base of the volcanic mountains, Accordingly there are spas and sanitariums nestled among the mountains and on the banks of the lakes. Some of these spas are centuries old. In ancient days, as well as in modern times, people have sought the clear rarefied air of the mountains and the natural warmth of the springs for rehabilitation from illness. The name Foi originates from the ancient nation that lived among the Spichelamos. Tradition has it that the Foi have always lived in the Spichelamos, ignoring the ebbs, flows and conflicts of other nationalities around them. One other tradition also holds that the founders of Ceiolai were Foi, or at least cousins of the Foi. Throughout the centuries of the Ceiolaian Empires, the Foi were loyal allies of Ceiolai, and in exchange the Emperors allowed the Foi special status and self-government. The Foi traditionally were divided up into little tribes whose occasional internecine quarrels and feuds became the stuff of epic tales. They were exquisite builders with stone, and many of the centuries old masonry structures, including retaining walls, bridges, temples, and tunnels, still are in use today. Through the Foi territories snaked roads that served as the shortest path between Rasecin and Amota and, therefore, which carried much trade. The Foi tribes were made richer for this trade and they were able to display their modest wealth by constructing small castles and villas in the high places, neatly adorned with beautifully statuary crafted out of the indigenous granite and marble. It was traditional for the Foi to reside in these places continuously, even if repairs and rebuilding sections was difficult. This tradition continues to this day, and a small number of these villas have been continually lived in for 1500 years. In modern times, the Foi are no longer ethnically distinct, due to centuries of intermingling and intermarriage, and the people who live in the Spichelamos are part of the mainstream Minidun culture. However, they are proud of their heritage and mountains, and they revel in the distinctness in their way of life.